Vision Care Optical Services (Pvt.) Ltd.., opened its 26th branch on April 17, at K-zone, Ja-Ela, which would offer their customers the latest frame and lens technology from leading manufacturers of the world. 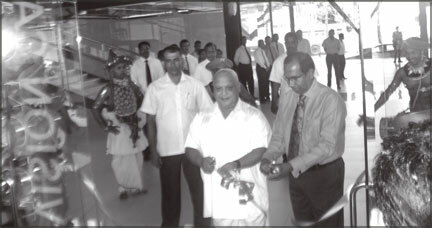 Minster of Social Services, Felix Perera, declared open the branch, by cutting the traditioinal ribbon. Apart from Minister Felix Perera, Dasantha Fonseka, Chairman and Board of Directors, including Ms. Kumari Fonseka, were present on the occasion. Chairman Dasantha Fonseka, expressing his views at the occasion, said "Vision Care Optical Services (Pvt.) Ltd., hopes to offer its services to customers in Ja-Ela, by opening this branch. Apart from the currently functioning branch at Realty Plaza, we hope to offer our customers value through our personalized services which would provide our highly professional and qualified Ophthalmic Technologists, Optometrists and Sales personnel, who would be using the latest technological equipment.